This antibody is expected to recognise both reported isoforms. Our Abpromise guarantee covers the use of ab51974 in the following tested applications. WB Use a concentration of 2 - 6 µg/ml. Detects a band of approximately 170 kDa. Cell adhesion molecule that plays a role in neuronal self-avoidance. Promotes repulsion between specific neuronal processes of either the same cell or the same subtype of cells. Mediates within retinal amacrine and ganglion cell subtypes both isoneuronal self-avoidance for creating an orderly dendritic arborization and heteroneuronal self-avoidance to maintain the mosaic spacing between amacrine and ganglion cell bodies. Receptor for netrin required for axon guidance independently of and in collaboration with the receptor DCC. In spinal chord development plays a role in guiding commissural axons projection and pathfinding across the ventral midline to reach the floor plate upon ligand binding. Enhances netrin-induced phosphorylation of PAK1 and FYN. Mediates intracellular signaling by stimulating the activation of MAPK8 and MAP kinase p38. Ig-like C2-type domains 7 to 9 are sufficient for interaction with NTN1 and commissural axon outgrowth. The transmembrane domain is necessary for interaction with DCC. Phosphorylated at tyrosine residues. Phosphorylation is enhanced by netrin. Secreted and Cell membrane. Localized in the soma, cell membrane, axon and growth cone of dissociated commissural axons. Observed band size: 170 kDa why is the actual band size different from the predicted? ab51974 has not yet been referenced specifically in any publications. Publishing research using ab51974? Please let us know so that we can cite the reference in this datasheet. I just want to know if this antibody can be used for western and immunoprecipitation, and what's the concentration do you guys suggest me to use for western blot and immunoprecipitation. Another question is, what if this antibody doesn't work, can we get the refund or get a new one? The reason I ask this is because sometimes, some batches of the antibodies just do not work due to some reasons. Thanks for your time, and I am looking forward to get a reply from you. Thank you for your enquiry. 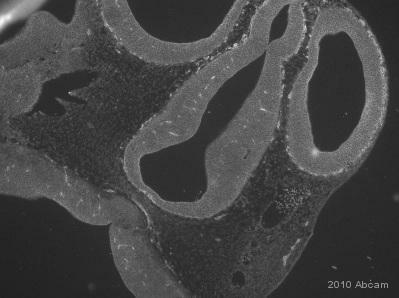 This antibody has been tested in western blot, but unfortunately, we do not have any data on IP. For western blot, we recommend to use the antibody at a concentration of 1 - 3 µg/ml. Please note, that IP is not a guaranteed application for this antibody. I you should have problems with one of our products, please let us know as soon as possible. With our Abpromise, we guarantee, that our products will work as described on the datasheet for 120 days. In case of problems, we will first offer a troubleshooting. If this does not help, you will be offered a free of charge replacement, a credit note or a complete refund. I hope, this information helps. Please do not hesitate to contact us again, if you have further questions.